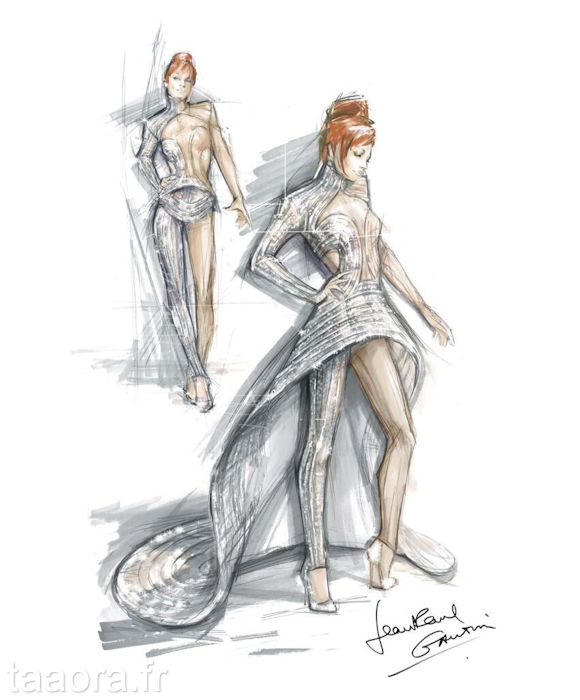 Barbarella, the heroine from the comic book created by Jean-Claude Forest, was one of the 3 inspirations, with Fritz Lang’s « Metropolis » and Joan of Arc, of the costumes that Jean Paul Gaultier designed for the beginning and the finale of Mylène Farmer’s « Timeless 2013 » concerts. Other Barbarella-inspired items and collections : Antoni & Alison Spring/Summer 2010 (one of the looks of this show was based on Jane Fonda in Roger Vadim’s « Barbarella »), Christopher Kane Resort 2011 (some shoes were named after Barbarella), Emma Cook Spring/Summer 2003 (the muse of this collection, Suzistyrene, was imagined by Emma Cook after she watched Roger Vadim’s « Barbarella »), Jean Paul Gaultier Couture Autumn/Winter 2009-2010 (look 38 : « Barbarella » corset), Matthew Williamson Spring/Summer 2005 (to capture the ’70s idea of the ideal woman from the future, Matthew Williamson watched movies such as Roger Vadim’s « Barbarella »), Tribune Standard Autumn/Winter 2013-2014 (to describe a neon pattern, influenced by Kremlin architecture, Tawfik Mounayer said that it was « babushka meets Barbarella »). To read about Mylène Farmer, « Metropolis » or Joan of Arc-inspired collections, search for the « Mylène Farmer », « Metropolis » and « Joan of Arc » posts that I have respectively published on October 2, 2012, May 31, 2012 and March 21, 2013. Fritz Lang’s « Metropolis » is one of the inspirations of the Givenchy by Riccardo Tisci Couture Spring/Summer 2012 Collection. Other « Metropolis »-influenced collections : Atelier Versace Spring/Summer 2012, Badgley Mischka Autumn/Winter 2012-2013, Bibhu Mohapatra Autumn/Winter 2010-2011, Emporio Armani Spring/Summer 2012, MaxMara Autumn/Winter 2012-2013, Roland Mouret Autumn/Winter 2003-2004, Thierry Mugler Autumn/Winter 1979-1980 (« Metropolis » draped tunic).